Want to take Brickset with you when you're out and about? Here's a list of apps that hook into our web services to provide access to our database and your collection on your mobile device. AWOB (a World Of Bricks) uses a built in database cache and web services provided by Brickset.com. It provides native access to a database of LEGO sets. 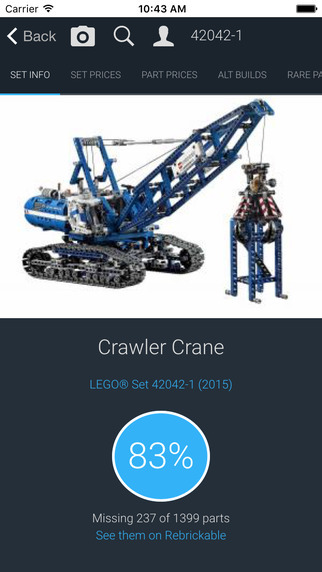 For fans of LEGO, AWOB is the best mobile guide to a wide range of LEGO® sets old and new. If you like Lego you will love this app! You can browse and search entire Brickset database, download build instructions and a lot more! Brick Data for iPhone is perfect to browse LEGO Sets on your mobile device, old and new. Bricking News brings the latest AFOL (Adult Fan Of LEGO) news to your iPhone, iPod Touch and iPad. Featuring the latest news from The Brothers Brick, From Bricks To Bothans, Eurobricks, and Brickset, you'll always be up-to-date on the latest news, events, and MOCs (My Own Creations) wherever you go. Need to look up a set while out? Bricking News also features a search function to search against the Brickset database of over 7,000 sets with results taking you directly to the mobile Brickset page without ever having to leave the app. Search, download and view Lego instructions on your iOS device! * Simple (and bricky) user interface. * Favorite your sets for easy lookup later. For fans of LEGO, Brickset Mobile for iPhone allows you to manage your collection of LEGO sets on your iPhone. Brickset Mobile uses a built in database cache and web services provided by Brickset.com to provide native access to a database of LEGO sets. iBrickset is the best mobile guide to a wide range of LEGO ® sets old and new. The MyFigs Minifig Collector is for Lego fans and minifig collectors of all ages. It is fun and easy to use, and it is all about your own personal minifig collection. Not sure if you should buy that LEGO® set? Simply scan the bar code on a LEGO box and see a wealth of information to help you decide if you should buy it. Rebrickable analyses your LEGO collection so you can find new sets that best compliments your existing parts. The Unofficial LEGO™ Minifigure Catalog App is a must for every LEGO enthusiast! It contains information about all the Minifigures and Sets from the early beginnings until 2011. Professional high-resolution photographs of every Minifigure and the associated data are included. Browse the Minifigures and Sets by theme or year. The Unofficial LEGO Minifigure Catalog App can even import/export with your data on Brickset.com. A unique application to browse and mange your entire LEGO collection including sets and all minifigures series. The advanced search allow you to find set and figs by name, reference, year, theme...or just use the barcode scanning feature. Need instructions? LEGO collector offer you the possibility to save set instructions on your phone. Customise your user interface, just imagine (display all your collection, minifgures only, currencies used...). All stored informations are linked to your brickset.com account (needed to use advanced functionality). LEGO® Database with over 10.000 Sets!! All info you need about almost any LEGO® Set in one app! If you have a Brickset.com account you can also keep track of Sets you own or want. Easily maintain your LEGO minifigures collection. Update owned, set wanted. Possibility to synchronise with your brickset.com account. Pull initial data (so you don't have to go through your collection and update owned status), simply update owned and wanted status of minifigures. Browse the LEGO catalogue & prices offline, or download building instructions. If you're a LEGO fan you're going to love myBrickset - the only Android app that gives you instant access to the entire LEGO catalogue. Browse the entire LEGO database offline, including retired sets. View official building instructions, even for retired sets. Includes retail price information for the UK, US and Canada - never wonder again if you're paying too much for your LEGO! Brick Manager allows you to browse the Lego catalog and manage your Lego brick collection on the go. Brickalog is an app for Windows Phone 7 which allows the user to enter the set number of a LEGO set and be provided with links to view the instructions for that set. It makes use of the web services provided by Brickset.com. You can also update your set ownership from within the app if you are logged in with your brickset.com account. A brickset.com client for windows phone. Keep track of your LEGO© collection. Find the sets you own or want and navigate to building plans, reviews and more. - Search by set-number- Search by free text search terms- Store the sets you own or want- View details about sets with links to building plans, reviews and more. Lego Minifigures uses Brickset.com web services, here you can search all the released figures and login with your Brickset account to add figures you own or want. This app only shows Collectable Minifigures. 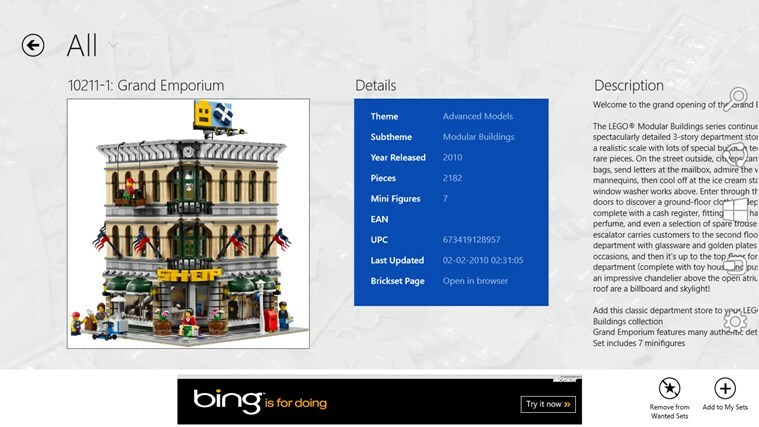 Brick Hub is a Windows Store app allowing the user to browse information about all old, new and forthcoming Lego sets and Lego themes by utilizing online web services. It provides access to set pictures, set information as well as downloadable instructions for each set (where available). Furthermore, it implements searching through the Windows 8 Search charm. Moreover, it allows the user to associate his or hers Brickset account to store and modify personal owned and wanted lists. Finally, it facilitates sharing of set information with other apps and people through the Windows 8 Share charm. A Chrome browser extension that displays a tooltip over a known Lego set number on any webpage.